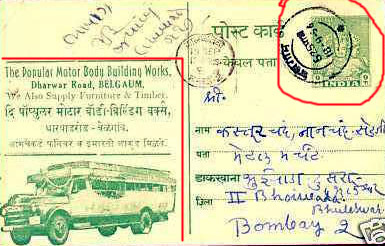 This is a postcard sent in the year 1956; exact date of stamp is 18-09-1956. The important part is the advertisement or is it the senders address no sure about that. But the truck body building industry is very famous in Belgaum but very little is known about it to the public at large. Still some of them exist on the side road now; on the NH4 towards Bangalore also a few are still there on Dharwad road. The chassis are converted into truck bodies by use of wood normally sourced from neighboring areas. I guess the Popular Motor body building works still exists, again not 100% sure about it.